223 3/1/1873 Robin Cumberland Consolidation Coal Co.
484 3/27/1874 Russell, Dr. Charles F. Maryland Consolidation Coal Co.
250 3/1/1873 Sanford, M. Williamsport American Coal Co.
238 3/1/1873 Scow Antietam J. S. Ahl & Co.
249 3/1/1873 Shepherd, Wm. Bakersville American Coal Co.
447 4/14/1873 Sherman, George New York American Coal Co.
412 4/7/1873 Shreve, W. J. 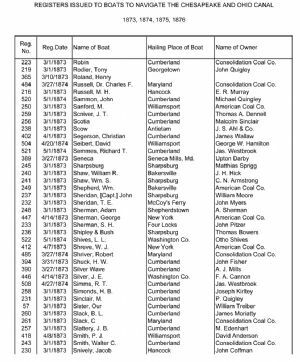 New York American Coal Co.
485 3/27/1874 Shriver, Robert Maryland Consolidation Coal Co.
261 3/1/1873 Slack, C Maryland Consolidation Coal Co.
243 3/1/1873 Smith, Walter C. Cumberland Consolidation Coal Co.